The Algarve is the southwestern corner of the Iberian Peninsula and is an intoxicating mix of Atlantic and Mediterranean influences. It was the last major European surf region to be explored and although it doesn’t contain the classic reefs of central Portugal, the potential for good, uncrowded waves is high. The countryside is a gently undulating mesh of forests and small fields, leading down to an undeveloped coastline of high cliffs and long empty beaches scattered with rocks. The small, lively town of Sagres is well located to take advantage of the wide swell window of Cape St-Vincent, where the west and south coasts meet, creating a perfect corner for both beginners and experts to revel in the fun waves. The Algarve has been every foreigner’s favourite slice of Portugal for decades now and surfers are no exception. It might lack some of the wave quality of Peniche and Ericeira but the laid back country vibe more than makes up for that, attracting ever increasing numbers of foreign surfers escaping from the icy winters of northern Europe. Being on the corner of the Iberian Peninsula means the Algarve has the widest swell window in the country and regular offshores on the south coast. SE wind swells can get these usually flat beaches pumping, while big winter nor'westers will wrap into the coves beyond Sagres. The Algarve is a year round destination but autumn through to spring is really the peak period because the summer can be stinking hot and with long flat spells. Winter can still be warm enough for t-shirts and the water is the warmest in Portugal. Consistency is the word to best describe southern Portugal’s surf. The same can not be said for the winds around Cape St Vincent which are notoriously unpredictable and treated with suspicion by the local sailing fraternity. Strange swirling gusts and onshores when the weather map says offshore are known to happen, but on the whole, the Algarve area follows the general summer “nortada” and winter SW storm winds followed by NE to SE offshores. When the winter offshores do blow, they blow hard and make blind take-offs a regular occurrence. The S wind or “levant” as it is called in the Mediterranean is prone to disappear as quickly as it arrived, and the swells produced are very fleeting. Average wintertime swells on the west coast are around 8-10ft, with 12-15ft maximums, whilst summer rarely goes flat and regularly gets up to double overhead. The south coast offers perfect shelter with offshore winds and a filtered swell although it is usually flat in summer. The “Nortada” is the dominant wind coming from the N-NW; it usually blows from April to September making a mess of most surf spots at this time. Tides vary from 4-12ft. Despite its Atlantic position, the Algarve enjoys a Mediterranean climate with cool to mild winter temperatures, it never freezes and 20°C (68°F) at noon is common. Summers are hot, and less than 60mm winter rainfall per month, puts the Algarve at half the national average. Camping is still an option in winter. 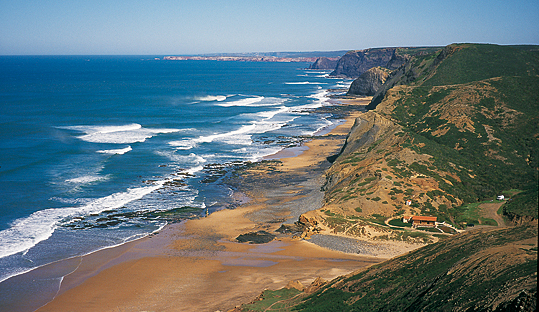 The water is warmer by 1-2°C (3-5°F) than central Portugal, with Sagres ranging from 14-22ºC (58-72ºF). Cold currents can hit the coast at any time so take a range of rubber. Cape St-Vincent contains a fortress where Prince Henry the navigator, established his famous school of exploration. The nightlife in Sagres and even more so Lagos, is wild and raucous when summer brings the backpacking hordes. Beware the absinthe! Aljezur near Arrifana has some good ruins to visit. Apart from rocks and some localism, there’s little to worry about. The undeveloped west coast has few or no locals outside the towns and the Sagres surfers tend to stay at their home breaks. The area is slowly getting more and more crowded, but the vibe remains chilled-out as there are a lot of waves to choose from. Respect the sharp rocks at the pointbreaks and strong rips at certain breaks. 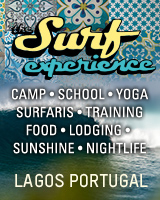 There are surf shops in Lagos (Magic Board Center, Lagos Surf Center, Jah Shaka) and Surfers Lab in Sagres. The Algarve is a well-established tourist destination so English is widely spoken. Reckless driving is the national sport, and the N126 has an abnormally high death toll!